Panopto is the UW-IT supported lecture capture solution. Use it to easily record and review videos from courses, lectures, and presentations. Recordings in Panopto are viewable on most Web browsers and mobile devices. Students can review your lecture and slow down the parts they may have missed the first time around. This is especially helpful for ESL students, students with disabilities, and students with different learning styles. If a student does miss class, they can watch the recording rather than waste your time repeating the lecture during office hours. Students can watch your recorded lecture before class meets and use class time to work together or have a discussion. 98% of students agreed that Panopto contributed to their learning. 94% felt more secure about learning. 91% agreed that viewing recordings improved their grades. Worried your students won’t attend class? Researchers in the UK found that attendance didn’t go down and in some cases attendance actually went up when instructors recorded their courses using Panopto Some instructors give more quizzes in class to encourage attendance. Having a bad hair day? Don’t use the camera on your laptop, or select a camera angle that doesn’t point to you in the classroom. Don’t want your mother to see your recordings? The creator of the recording controls who can view it. By default, students in the course can view course recordings. If you teach a course listed in the UW Time Schedule, in a classroom that supports the automated Scheduled Lecture Capture (the rooms with an Automated Panopto Recorder in the classroom list), you can schedule your recordings through Canvas. If you are teaching in a room with an AV Bridge that doesn’t have an Automated Panopto Recorder, you can connect your laptop via a USB cable and then use the cameras and microphones in the room and record from your laptop. Download the correct version of the recorder for the OS you are using and follow the installation directions. If you have already downloaded the recorder, on the Record a New Session page, select Launch Panopto. Select the folder for your recording; by default it will be your course folder. Make sure that an audio and video source is selected. Note: You must at least have audio in order for the recording to be complete and usable. Choose any of the following: video, screen capture, PowerPoint or Keynote capture. Note: In order to properly record PowerPoint presentations, after you have launched PowerPoint, you must have it in full-screen presentation mode. Give your recording a name that will make it easy for your audience to identify. The default name is the date and time when the recording was created. Click the red circular Record button. To finish the recording click Stop. You may enter a description that will display under the recording title in Canvas and Panopto. Select Upload. You will then see the upload status on the Manage Recordings screen. 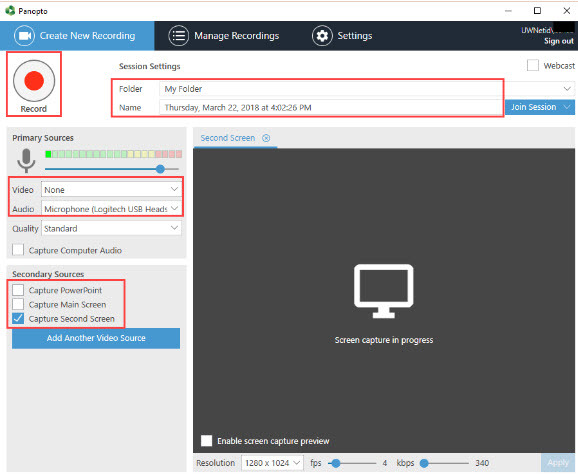 Tip: if you are using your computer to record in a classroom, make sure your microphone works well with Panopto. If you (or anyone else in your class) are speaking several feet from your microphone, you may sound great in the classroom, but students may not be able to hear you in the recording. See also Get started FAQs and Manage Classroom recordings. 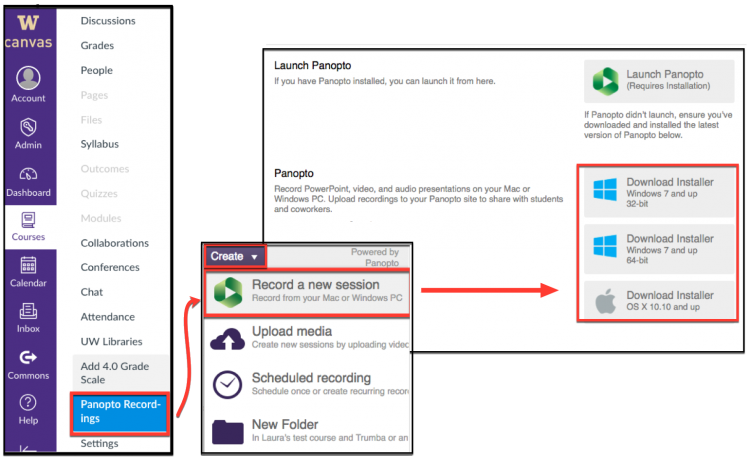 For more information on how to create a recording, see Panopto’s documentation.